The TomTom Rider is the GPS device for your Motorcycle. Now while some of you would try to fit an ordinary GPS unto your motorcycle, there are disadvantages on trying to fit a car GPS device on a motorcycle. First, a motorcycle needs a GPS device that is specifically made for it since you really don't have a whole lot of dashboard on a bike. Second, you want your GPS device to withstand all weather conditions and an in-car GPS device isn't really designed to withstand weather conditions since it is mainly protected inside the car whilst a stand-alone motorcycle device should be able to withstand all weather conditions. The good news is that the TomTom Rider has the two basic qualifications for a good motorcycle GPS. 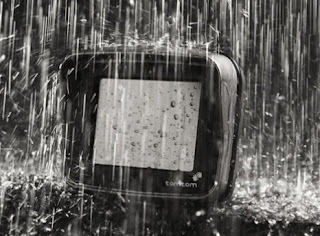 The TomTom Rider includes a mounting kit that should fit most motorcycles and it is waterproof. The TomTom Rider has a large 3.5 inch touch screen that is responsive enough and is easily readable in direct sunlight. The TomTom Rider also comes with a SD card that is preloaded with maps of the United States and Canada, though be warned that some points of interest will be a little outdated since this device has been released way back in 2006. The TomTom Rider also comes with a lot of accessories such as Bluetooth and wired headset, 12-volt power cable, an AC adapter, USB cable, carrying pouch, and a screen wipe cloth. However, the Bluetooth headset has crap sound quality so just use your own Bluetooth headset or buy a better one. As for the GPS antennae, well, it took around 2-2.5 minutes to lock in my position which is really pretty fast but I guess you have to be on a place with a pretty good signal. It also has a text and voice guiding directions. The TomTom Rider is a pretty solid enough device for those that just want to get directions while riding their bike. Try to upgrade to the latest firmware version though if you're encountering some problems.